From the award-winning creators of MY VERY FIRST MOTHER GOOSE, an invitation to the simple joy and the sly humor that are the essence of Mother Goose. Spread the word—here comes Mother Goose—and with her comes an entire procession of best-loved nursery rhyme characters, including Mary Mary Quite Contrary, Simple Simon, Old Mother Hubbard, Little Tommy Tucker, the Queen of Hearts, and many more. Joining them is an array of colorful folk you may not have met before: Mrs. Murphy, for instance, and My Aunt Jane; Freda the American Beauty, Bonny Bobby Shaftoe, and Dusty Bill from Vinegar Hill—each of them well worth getting to know, as we're sure you'll agree! In a partnership with her late husband, Peter Opie, she has edited many acclaimed books for children's folklore, including THE OXFORD DICTIONARY OF NURSERY RHYMES. Rosemary Wells is the author and illustrator of more than 60 books for young readers. She has won many awards for her work, including more than 20 ALA Notable Book citations, THE NEW YORK TIMES BOOK REVIEW Best Illustrated Book of the Year Award, and the BOSTON GLOBE-HORN BOOK Award. 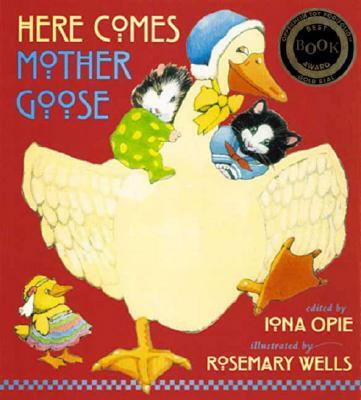 About Mother Goose, she says, "Mother Goose is a real culture. It's the real words of people who lived long ago. These rhymes are a celebration of the English language—it's our history and it's wonderful." Rosemary Wells lives in Briarcliff Manor, New York.